After nine years of Congressional debates and regulatory wrangling over the Food Safety Modernization Act (FSMA), the deadlines for compliance are now in effect or rapidly approaching, depending on your business. 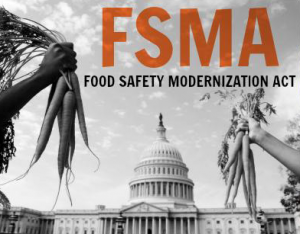 FARFA helped lead the national coalition to add the Tester-Hagan amendment to FSMA, preventing small-scale producers from having to spend thousands of dollars to comply with these new regulations. But there’s still work for you to do: Producers need to confirm that they fit within the exemptions and take some steps in terms of record-keeping, signage, and possibly registering & filing statements with the Food & Drug Administration (FDA). The most recent development is that the FDA has posted the documents outlining how small-scale “facilities” can register & submit the statement that they are exempt from FSMA. Please note: FSMA and the FDA use the term “qualified farm” or “qualified facility” to describe those farms and businesses that fall within the Tester-Hagan exemption. A qualified farm or qualified facility (explained below) is effectively exempt from the bulk of the expensive, difficult requirements under the FSMA regulations — but, again, you need to comply with certain paperwork requirements. FOR PRODUCE GROWERS: If you grow fruits, vegetables, nuts, or mushrooms, you need to look at the exemption for the Produce Safety Rule. In brief, you are a “qualified farm” if you sell less than $500,000 in food annually and more than half of your sales are to individual consumers, local restaurants, and local retailers (where local is defined as within the same state or within 275 miles of your farm). If you are a qualified farm, you do NOT need to register with the government or submit any documents to support the exemption. You DO need to keep your own records in case the FDA or state agency investigates. You also need to post a sign at the point of sale, or provide an invoice, that includes your farm name and address. These record-keeping and signage requirements are already in effect. Farms — If you are simply growing, harvesting, and selling produce without doing any processing (other than drying whole, uncut items), then you are NOT a facility and you do not need to register or file anything with FDA. Retail food establishments — If the main purpose of your business is to sell directly to individual consumers, you are a retail food establishment. Your primary function is judged by whether the majority of the monetary value of your sales (of all foods) are directly to consumers. For this definition, sales to businesses do not qualify as direct sales. Retail food establishments are NOT facilities and do not need to register or file anything with FDA. Qualified facilities — If you don’t fit within the definition of farm or retail food establishment, then you are a “facility.” All facilities must register with FDA and comply with current Good Manufacturing Practices (which have been incorporated into most states’ requirements for a food manufacturers’ license). If you gross less than $1 million annually in all food sales, however, you are a “qualified facility” and do NOT need to comply with the new Preventive Controls’ requirements under FSMA. You DO need to submit a sworn statement to FDA that you are a qualified facility. The FDA’s latest action relates to the qualified facility exemption, for those who are neither farms nor retail food establishments, but still grossing less than $1 million annually. If you are a qualified facility, you have until December 17 of this year to register and file your statement. Starting October 1, facilities will be able to submit these attestation forms electronically at https://www.access.fda.gov/ via the Qualified Facility Attestation Module. Note that there is also a Preventive Controls Rule for animal foods. The same three categories of exemptions apply: farms, retail food establishments, and qualified facilities. The cutoff for qualified facilities for businesses selling animal foods is $2.5 million in gross sales annually. For more detailed guidance on the exemptions to both rules, check out the flow charts posted at www.FarmAndRanchFreedom.org/fsma. The gross sales cut-offs are all adjusted for inflation and based on your average sales over the past three years. FDA has the inflation-adjusted numbers posted at www.fda.gov/Food/GuidanceRegulation/fsma/ucm554484.htm. FDA’s Guidance Document includes guidance on how to determine if you are a qualified facility, and thus not subject to the Preventive Controls Rule (although you do have to register as a facility): www.fda.gov/Food/GuidanceRegulation. Link for registering facilities: www.access.fda.gov/. Instructions for submitting Qualified Facility Attestation (sworn statement for the exemption): www.fda.gov/Food/GuidanceRegulation/FoodFacilityRegistration.